You know it and we know it – being visible on YouTube has become essential to any company that wants to promote their brand through video marketing. The problem is that being found by your potential customers on YouTube isn’t that easy – you have to beat millions of competitors with larger budgets and brighter videos. Being visible on YouTube and ranking high in its search results requires thorough search engine optimization (SEO), a wise distribution plan and, above all, a quality marketing video. Today you’ll learn the basics on how to rank number one on YouTube with your own video. But I’ll not just describe how to do it; I’ll explain and demonstrate each step by using a successful case study from Yum Yum Videos: their explainer video got ranked number one on YouTube under the most valuable business keywords in just 3 months, so it will serve us as a clear example on each step. You can also get the free step-by-step eBook “How To Rank #1 on YouTube” which expands on this effective strategy. You might wonder: why choose YouTube as a video hosting site? And why spend time and effort reading this piece to gain a good position in its search engine rankings? First of all, with over 1 billion active users worldwide, YouTube is the 2nd largest search engine in the world (behind its owner Google, but above Yahoo! and Bing) so it’s not just an average hosting site. Then, what many people don’t take into account is that YouTube is also a massive social network; it actually happens to be the world’s 3rd largest social network, behind Facebook and Twitter. This alone makes YouTube a perfect spot on the web to promote your brand. But the thing is, you can’t really be on YouTube without a video, and even then: you won’t rank high in the search engine without a quality marketing video, simply because yours need to stand out among the 4 billion videos that are watched on it every day… and that leads us to the next point. The problem with marketing videos is that you need to make a quality one, or else YouTube will send it to the dark bottom of its page results, even if you spend your whole budget on advertising. Why is that? Because YouTube cares a lot about complete video views, and the amount of time people spend watching a video is one of the factors YouTube cares about when setting up its SERP (search engine results pages). And, let’s face it; no one would care to watch a video all the way through if it’s not well made! Ok, so you have a quality marketing video and you want it to climb up the YouTube results page. What you need now is a clever video SEO strategy and some wise keyword planning in order to optimize your video’s performance on the site. First of all, you should learn which words from your business niche come up frequently on YouTube and how many people usually search for a particular word by using a SEO tool such as Google’s keyword planner. However, don’t fight over the most searched keyword terms because that would be really hard to rank for. I recommend using longtail keywords instead: they’re longer and contain more specific phrases, which do include your main keywords, but have less people fighting over them. In our case study, the longtail keyword is “the best explainer videos”. Longtail keywords drive precise views from potential customers way faster, helping your video to rank under the main keyword too. Once you find your own, don’t forget to use them everywhere in YouTube: titles, descriptions, tags, etc. Titles help people get what your video is about before hitting the play button, so it’s vital to place your keywords in it. Now don’t forget to keep your titles brief and direct. I recommend using less than 70 characters, because longer titles are cut off in the YouTube results page. On the other hand, try to avoid writing titles that don’t represent the true content in your video. Tricky or misleading titles cause a huge drop-off that will reduce your video’s performance. Thumbnails are essential SEO features because they act as the only preview for your video on the YouTube results page and suggestions. Besides, it’s proven that a spot-on thumbnail will invite more people to press play on your video, but a badly-chosen one will drive them away. Therefore, you should choose your thumbnails carefully. As with your title, don’t cheat with a misleading thumbnail. People hate tricky thumbnails. On the other hand, use only hi-resolution images (640×360 pixels at a minimum) and make sure that the thumbnail looks good in both small and large sizes and on different devices (TV, iPad and desktop PC). If your image is not attractive enough, people simply won’t click on it. Descriptions explain what your marketing video is about. You need to make them short and accurate (around 2 sentences are perfect) but don’t forget to use your business keywords. It’s also mandatory to include a link to your own site within those two sentences, and you can add links to your social media channels as well. These actions will increase your website traffic and create a great opportunity to drive potential customers to your brand. Now, for this strategy to drive concrete marketing results apart from views and SEO purposes (for example downloading your content, subscribing to your newsletter, visiting your site, etc.) you need to encourage your viewers to take action by adding a clear call-to-action in the form of a clickable button. In order to set up its results pages, YouTube considers all the websites where your video is embedded and played on, and also takes into account the amount of YouTube views that come from those sites. Then, if you really want to enhance your Video SEO strategy, you need to distribute your video in the right spot for potential customers to watch it. Investing some money in YouTube Ads (aimed to the right target audience) can give an initial boost to your video marketing campaign, making you clinch a first bunch of viewers and allowing YouTube to start measuring your videos’ performance. However, after that first push, it’s better to rank organically on YouTube, because it gives your video more credibility and fairness. You must drive your marketing video forward to make it rank number one on YouTube. Besides embedding your video on your blog (and other people’s blog) use it in landing pages, press releases, email marketing campaigns and social media posts, to then measure its overall performance. Remember that your video can turn into a powerful marketing tool to suit your online campaigns. 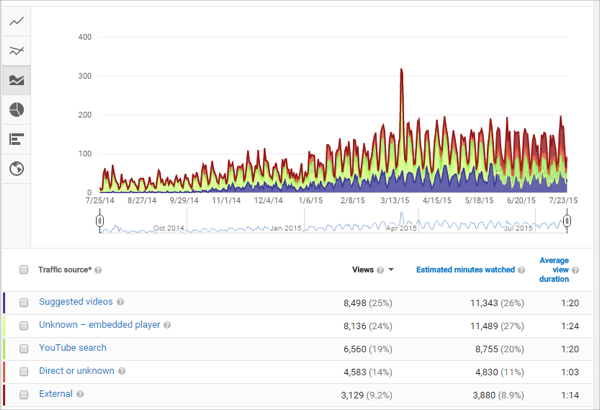 As you can see, views came almost exclusively from the embedded player source -in light green- during the first 3 months (that’s blogging and guest blogging playback). But then YouTube’s organic visits -in purple and dark green- (those are direct searches and video suggestions playbacks) began to rise, because that’s when the video started to rank number one on YouTube’s search engine results page. From then on, the animated video started to gain 300% more views every day, comparing it with day 1. 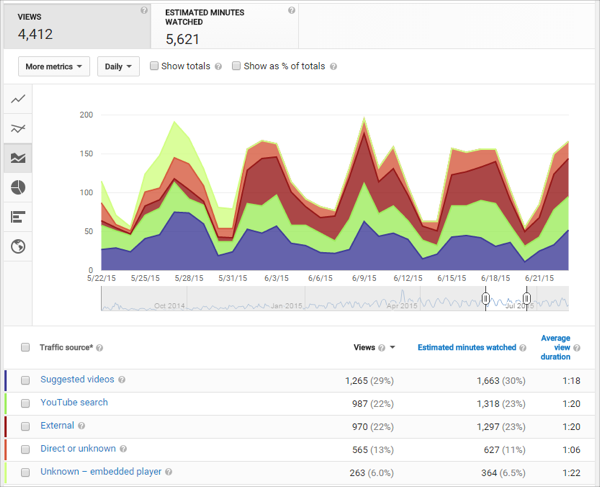 Views keep growing by a monthly 20% on average. As today, the video has over 30,000 views and holds the number one position under Yum Yum Videos’ most valuable keywords. Now you’re ready to build up your own videos and set up a wise video SEO strategy to start ranking high on YouTube’s search engine results page! Remember that you can download Yum Yum Videos’ free eBook to widen this knowledge and learn how to craft a quality marketing video to compete with. Online video marketing is growing. Audiences and advertisers are rushing to online video, eager to consume and capitalize on digital entertainment. In March 2013, 85% of US internet users viewed online video, and video ads accounted for 25% of all videos viewed (source). Surprisingly though, many marketers are hesitant to shift advertising dollars—this year they’ll spend $66 billion on television and only $4.14 billion on online video marketing (source). American audiences are constantly engaging in online video viewing. In June 2013, 85.2% of US internet users watched video and the total number of videos viewed reached 44 billion, a 7% increase from May (source). As the most popular online video publisher, YouTube receives over 1 billion unique users per month who watch over 6 billion hours of video (source). Advertisers are developing an online video presence to reach audiences who are actively seeking out this kind of entertainment. In a Rocket Fuel survey, 42% of respondents (149 digital agency professionals) claim to be moving from TV to online video this year as part of the planning process. Media buyers (72%) are also increasing their budgets for online video by an average of 53% (source). As a result, the number of online video advertisements is growing rapidly with a 64% increase from 2012 to 2013 (source). Online video marketing is effective. Online video marketing is effective when it comes to exposure. According to a comScore report, video ad impressions surpassed 20 billion in June 2013. Video ads reached nearly 54% of the total U.S. population an average of 121 times during the month. Obviously, people are watching an ever-increasing amount of online video, but this isn’t the only reason you need to start creating video content. According to Nielsen and the IAB, shifting from television to digital video can enhance your campaign’s reach at a lower cost. It also makes the campaign’s reach more effective—generating an increase in general recall (+15%), brand recall (+33%), message recall (+45%), and likability (+40%). In a study from BrightRoll surveying 150 top advertising executives, 91% believe online video is equally or more effective than display advertising, 75% believe it’s more effective than TV, and 68% believe it’s more effective than social media. When it comes to TV, most advertisers are confident that online video can match its reach and engagement level—47% feel online video can outdo TV in generating awareness for the same level of investment, and 24% said it could at least match TV (source). The same survey found that 58% of respondents believe that for the same investment they can achieve better share of engagement with online video than with TV. Another 15% said online video would drive the same amount of engagement. Not only can you extend your campaign’s reach with online video, but you can also improve consumer-brand engagement. Many advertisers are utilizing online video in their marketing strategies and next year, 73% will increase spending on pre-roll ads and 53% on social video (source). Also, 25% of advertisers say online video will see the highest growth in media spending—23% said mobile video. 25% believe TV will see the lowest growth (source). This is just in response to viewer behavior; this year, time spent with digital media will surpass TV viewing time (average 5:16 hours a week with digital compared to 4:31 on TV). Marketers are meeting consumers on their preferred platform to maximize exposure and brand awareness. Evidently, online video marketing is where you need to be. Hannah Brenzel is the Content Marketer at ViralGains, a viral video marketing company based out of Boston. She recently moved three thousand miles away her home in California to the advertising mecca that is the East Coast. You can get more great info by following her on Google+. As a business owner, Entertainment professional, non-profit or internet marketer, one of the most sought after marketing dreams is the creation of the viral video. With over 4.2 billion YouTube views each day, the opportunity for exposure is inconceivable. But don’t be fooled. But just because you put your video is on YouTube doesn’t mean it’ll capture the kind of attention you are hoping for. Especially without a plan and the right formula. Do you know what does it take to accomplish the sought-after status of viral video? Is this a phenomenon of chance, or can it be intentionally planned? Most people spend lots of time and money creating videos. So why rush through the most important part? Did you know GOOGLE owns YouTube? Well they do. So what does GOOGLE look for within your video that will make your video found on all the Search Engines and Rank high in YouTube’s search Algorithm? GOOGLE only crawls/searches the First TWO sentences of your videos DESCRIPTION. So whatever you put in the first TWO sentences will be what GOOGLE uses to RANK your videos. I always recommend starting off with the main website you are wanting to drive the people watching you video to. Then place keywords and your video’s title in the description. Always add any social links as well. *NOTE when adding links you must use the https:// and NOT just the www. If you DO NOT use the https:// GOOGLE will NOT recognize your link. Figure out who also has to gain by your video going Viral. When your video reaches the Millions, who are all the people and companies who will benefit besides you? In your YouTube description, fill it full of links to possible sponsors. Mention certain APPS (they are always looking for exposure), tag products, clothing lines, cars and even cities now have a strong social presence. Contact them all and ask them to share the video. Some of them will be happy to share your video and some will not. But try them all! It will ONLY increase your chances for exposure. Hundreds of Millions of people watch YouTube videos when they’re at work. Release your video on Monday or Tuesday to give it the whole week to gain momentum. Weekends are speed bumps. In my experience the best day to choose is Tuesday. Mainly because people are busy catching up with emails and Monday meetings. Anticipate the timing of you release and make sure there are NOT any major breaking news that day. Releasing on a slow news day will help you in the long run. Be mindful of your holidays, as well. Don’t release you video when people are not at the office. Remember 3 day weekends turn a Tuesday into a Monday. Understand and educate yourself on how things go viral on the internet. EVERYONE sees videos on YouTube with millions and millions of views and always wonder — where did they all come from? First and most obvious, posted to Facebook, Twitter, etc. But the UNTOLD SECRET is to submit it to social news sites like Reddit and Global Video Sharing Communities. Of all the social news site out there, Reddit pays off HUGE. My biggest advice is to following the advice in this article HERE. Bloggers who see your video on Reddit will start publishing articles about it on sites like Kottke, Mashable, Jezebel, and Huffington Post. You will quickly find that Blogs drive a ton of traffic to YouTube. Each blog is a giant marketing engine with millions of readers and twitter followers. It’s in their interest to get their articles up to as many views as possible, because each view FOR THEM is an ad they can serve up. You need to understand, for Bloggers, it’s all about clicks. Clicks = advertising dollars for them = more views for you. The more bloggers send it out the more GOOGLE/YouTube’s algorithms will rank you video higher. If you want long term success on YouTube make friends with and learn about BOLGGING because their marketing power is ridiculous and are almost always behind every VIRAL VIDEO. People will criticize your video but this is good because it gets them talking about you. Don’t let all this get to you. Controversy is always good. Viral videos generally have a short shelf life. You have the coveted “15 Minutes of Fame”, and your job is to open as many doors as possible in those 15 minutes. Create as many opportunities as you can. The week you release the video it’s very important responded to as many comments, emails and tweets as you possible can. Make sure the media can get a hold of you, do not make it hard for them to find your email address. When media interview requests start coming in accept them ALL. National TV may contact you. Feed the media beast. Be prepared with an email capture page and know where you want to direct your traffic. Link your blog, website, and Twitter from the video. Capturing emails is still the best way to get back in front of your audience. Don’t spend your time and money creating videos then sit back and just hope for them to go viral. Have a plan. Having this Knowledge with not help you or help make your video go viral. It’s ALL about APPLYING the knowledge and implementing it into your next video campaign! Stay well and look out for more useful articles.